Pulitzer Prize-winning historian Taylor Branch will present “Myth and Miracles from the King Years," Howard College’s 2012 J. Roderick Davis Lecture, Tuesday, Oct. 16. The 7:30 p.m. event in Wright Center Concert Hall is free-of-charge and open to the public.King Biographer Taylor Branch To Present Davis Lecture Oct. 16. Branch began his journalism career in 1970 with The Washington Monthly, Harper’s, and Esquire. He is the author of many books and articles but is best known for his Civil Rights trilogy, “America in the King Years”. 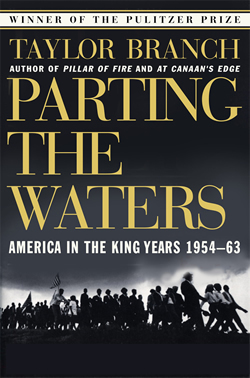 The first volume of that series, Parting the Waters, earned the 1989 Pulitzer Prize for history. Among Branch’s many other laurels are honorary doctoral degrees from seven colleges and universities, the Dayton Literary Peace Prize Lifetime Achievement Award (2008) and the National Humanities Medal (1999). Samford history professor and Davis Lecture organizer Jason Wallace noted that 2013 marks the 50th anniversary of the Civil Rights Movement’s Birmingham campaign. “Taylor Branch's remarkable achievement with the King trilogy made him a natural choice for Samford’s inaugural event in a year-long series of commemorative reflection on this important moment in our city, our state, and our nation". Branch’s appearance at Samford will be a homecoming, of sorts. Although he is new to the modern university, his parents, Franklin T. Branch and Jane Worthington Branch, met as Howard College students at the East Lake campus during WWII (see Seasons, Fall 2006).